Metric system was born when France adopted the system in 1795. Gabriel Mounton, a French vicar, proposed the system in 1670. The Convention of the Metre in 1875 standardized most measurements. Today the United States is one of only a few countries that do not use the metric system. Children can learn more at: Metric System. United Nations World Health Day remembers the creation of the World Health Organization (WHO). This year’s theme is “Universal Health Coverage: everyone, Everywhere.” WHO has six agendas: promoting development, fostering health security, strengthening health systems, harnessing research, information and evidence, enhancing partnerships, and improving performance. Children can learn more at: http://www.who.int/world-health-day/en/. Internet’s symbolic birthday is today in 1969 when RFC1 (Request for Comments) was published. Children can view a timeline of the internet at: http://www.factmonster.com/ipka/A0193167.html. 2001 Mars Odyssey was launched on this date and reached Mars on October 24, 2001. The robotic satellite began to send back data on February 19, 2002. Now 2001 Mars Odyssey is the oldest operating spacecraft beyond earth. Children can learn more at: 2001 Mars Odyssey. Donald Carrick (born Dearborn, Michigan, 1929; died Edgartown, Massachusetts, 1989) wrote and illustrated children’s books. His wife, Carol, and he collaborated on 37 books. Their books include Patrick’s Dinosaur and Drip Drop. El Greco (born Domenikos Theotokopoulos in Iraklion, Crete, 1541; died Toledo, Spain, April 7, 1614) was a great painter. He studied in Venice in 1559 or 1560. Looking for patrons, he moved to Toledo, Spain, in 1577. Named “The Greek” by the Spaniards, he spent the rest of his life in that country. His paintings, especially for the time, were fairly abstract. He used light and dark colors to his advantage, and he distorted figures to achieve an emotional impact. Children could visit a website at: El Greco. Billie Holiday (born Eleanora Fagan in Philadelphia, Pennsylvania, 1915; died New York, New York, July 17, 1959) was an African American singer. Children can learn more about her at: Billie Holiday. Cheryl Willis Hudson (born Portsmouth, Virginia, 1948) writes books for children. Her books include Hands Can and Let’s Count, Baby. Children can learn more at: Cheryl Willis Hudson. Will Keith Kellogg (born Battle Creek, Michigan, 1860; died Battle Creek, Michigan, October 6, 1951) was a cereal manufacturer. 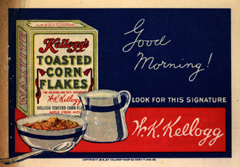 Known as the “King of the Corn Flakes,” he started a cereal company in 1906 and made a $50 million fortune. Idea: Children could make a bar graph of favorite cereals. They could also see a timeline of cereal development at: http://www.kellogghistory.com/timeline.html. Tony Palazzo (born New York, New York, 1905; died Hastings-on-Hudson, New York, September 10, 1970) wrote and/or illustrated about 65 books for children. He received a Caldecott Honor Award in 1947 for Timothy Turtle. Other works include Animals of the Night and The Biggest and Littlest Animals. William Wordsworth (born Cockermouth, England, 1770; died Grasmere, England, April 23, 1850) may have been the most significant English romantic poet. He wrote over five hundred sonnets, and he collaborated with Samuel Taylor Coleridge to write Lyrical Ballads. Wordsworth actively supported the French Revolution. Children can read his works at: William Wordsworh.